Does hippocampal hyperactivation cause cognitive deterioration? To activate or not to activate: does hippocampal hyperactivation cause cognitive deterioration? After his famous opening words, Shakespeare’s Hamlet wondered “Whether ’tis nobler in the mind to suffer… Or to take arms”. Scientists, too, are puzzling about whether or not to take action, albeit of an entirely different kind: whether or not to suppress the increased brain activation seen in certain diseases. A paper published in Neuron earlier this month concluded that reducing excess brain activity by means of an antiepileptic drug has beneficial effects on memory in a condition called amnestic mild cognitive impairment. The authors also suggest that the drug’s effect may be able to slow down progression to Alzheimer’s disease. Another glimmer of hope for those at risk for or suffering from this devastating disease currently lacking any effective treatment? Or just another exciting discovery never to be heard of again if it fails rigorous clinical testing? First, let’s have a closer look at the aforementioned paper by Bakker and colleagues. They studied a group of patients with amnestic mild cognitive impairment (aMCI), a condition characterized by a predominant memory loss which often progresses to Alzheimer’s dementia. The memory problems are linked to the hippocampus, which is one of the first brain regions to become damaged in Alzheimer’s disease. Brain activity in the hippocampus, as measured by functional magnetic resonance imaging (fMRI), is on average greater in these patients compared to normal activity levels measured in age-matched healthy volunteers. Such greater-than-normal activation of brain areas in a dysfunctional brain is commonly interpreted as a compensatory mechanism recruited to counteract the damage present. Quite often, we assume this kind of compensation is beneficial, since plenty of studies have found correlations with improved cognitive performance. Structural MRI of the left hippocampus. The blue area is the hippocampal subregion under investigation in the study by Bakker and colleagues. However, there are reasons, e.g. from animal studies and language recovery in stroke patients, to believe that hyperactivity may sometimes be harmful instead. For example, the hyperactivity may disturb actually useful activity; like loud irrelevant noises next door may prevent you from reading and understanding this text. Also, brain cells become damaged when exposed to high activity for too long. Bakker and colleagues wanted to test the hypothesis that hippocampal hyperactivity in aMCI patients is harmful, contradicting some previous claims to the contrary. Despite my later comments, which are for the most part nitpicky remarks you can apply to many other papers, this paper’s main idea is actually very interesting. 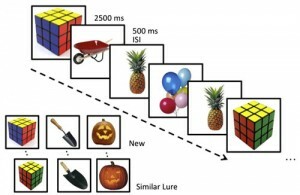 Unlike the majority of functional imaging studies in this domain, which are limited to correlational inferences, Bakker and colleagues specifically attempt to observe a causal relation. The distinction between correlational and causal is quite important, and more often than you’d think people are prone to overinterpretations due to a blurring of the two concepts. Functional imaging methods, such as fMRI, show which areas of the brain are active when subjects perform a certain task. Even if this activity fluctuates similarly as changes in subject performance, we can only infer from such a correlation that the area is somehow involved in that task. We cannot, however, say for certain that the area is also critically necessary in order to be able to perform the task. If this all sounds a bit vague, consider the following hypothetical example. Let’s imagine that area A is responsible for the memory function under investigation. Right next to A lies area B, which is not involved in meory processing but projects inhibitory connections to a remote area C. If the brain is lesioned in the area comprising A and B, area A’s dysfunction causes memory problems, while the loss of inhibitory control of B over C causes a relative hyperactivity in area C. Hence, hyperactivity in area C and memory symptoms may be correlated without area C being involved in causing the behavioural symptom. One easy way to infer causality is to perturb the system, in our case ‘incapacitate’ the supposedly essential brain area and see whether this is indeed sufficient to cause changes in subject behaviour. In Bakker’s study, the perturbation is the administration of a low dose of an antiepileptic drug known to lower activity in the hippocampus. A subsequent fMRI scan confirmed that patients on the drug showed the expected decreased hippocampal fMRI activity compared to placebo while they were performing a specific memory task. This task was designed to activate the same subregion of the hippocampus that shows excess activity in rodent models when the animal fails to encode new information. This hippocampal subregion is thought to be involved in determining if a stimulus, here pictures of everyday objects, is ‘old’ or ‘new’, i.e. whether it has or hasn’t been seen before in the context of the task. Experimental memory task. For each picture shown in a series, subjects indicate whether this is a new or old stimulus (i.e. never or previously seen within the context of this task). Similar lures are easily mistaken as old. Patients tended to wrongfully identify ‘new’ pictures as ‘old’ if those pictures were very similar to ones that were presented earlier in the experiment. This is thought to be due to a decreased ability of the hippocampal area to separate the only slightly different patterns of brain activity associated with similar stimuli. Have you ever (almost) waved or shouted at a stranger because, from afar and in the rain, they looked so much like one of your friends? Likewise the brain of these patients sees a familiar pattern, and rather than scrutinizing it more carefully it tends to complete it with information from memory, resulting in similar but ultimately ‘new’ pictures being wrongfully labelled as ‘old’. Reducing the excess hippocampal activity, however, seems to help the brain to discriminate better since patients improved significantly in identifying new stimuli as similar but not identical to previous stimuli. Since reducing activity improved behavioural performance, the authors conclude that increased hippocampal activation in aMCI is likely to be dysfunctional and contributing to the memory impairment seen in these patients. This has important therapeutic implications: disease progression in aMCI patients may be slowed down by low dose antiepileptic drugs or other interventions promoting decreased brain activity. The authors themselves encourage follow-up studies, because this is a very preliminary result, albeit one providing an interesting avenue for future research. So, why shouldn’t we hand it over to a pharmaceutical company to start clinical trials on a few thousand patients just yet? For starters, we can wonder about how specific the medication is. Levetiracetam is commonly used to treat epilepsy but its exact mechanism of action is unknown. It’s distributed more widely in the brain than just the hippocampus, so it may also have an impact on other brain areas which were not considered by the current study. It is possible that these brain areas could drive or modulate the behavioural changes to a certain extent. Remember how taking out area B had a remote but important influence on area C in our hypothetical example of correlation versus causality? In the current study, the authors limited themselves to scan only the medial temporal lobe (the area containing the hippocampus) rather than the whole brain. There is a very good reason for this omission, since it allowed them to get a higher quality scan of what is undoubtedly the primary area of interest. But even if the drug’s effect in other brain areas doesn’t have any impact on the memory task used in the paper, it may have other behavioural effects, especially after long term exposure. Maybe hippocampal function will return to normal, but the drug’s continued suppression of other brain areas may start causing other behavioural issues such as a decreased concentration, mood swings etc. The current study limited itself to a neuropsychological evaluation of memory using various commonly used tests, showing no effect of the drug on these measures. This in itself is a little worrying, since these neuropsychological measures are probing behavioural problems much closer to the patient’s experience in daily life than the specifically tailoired ‘new’ vs ‘old’ task. This begs the questions as to how beneficial the behavioural effect of the drug on memory would be in real life. Nevertheless, this doesn’t detract from the claim that it may still be a novel way to slow down progression to Alzheimer’s disease. In any case, a longitudinal study would be a logical next step. Finally, if you haven’t nodded off just yet, there is also a more fundamental issue involved in the interpretation of any fMRI scan, which we conveniently tend to keep rather quiet about. The exact way in which the fMRI signal relates to the underlying neuronal processes is, as of yet, still under investigation. The (mis)interpretations could probably fill a blog in their own right! fMRI is a fairly indirect way to measure neuronal activation. It detects changes in blood oxygenation by virtue of differences in magnetic properties between oxygen-rich and oxygen-poor blood. As a given brain area becomes more active, its neurons demand more fuel (glucose) triggering local blood flow to increase and more oxygen-rich blood to be delivered. Oxygen-rich blood is less magnetic than oxygen-poor blood, causing less disruption of the magnetic field and hence a higher MRI signal is obtained. Clearly, changes in neuronal activity are very closely related to changes in the fMRI signal, but there are a few reasons why a straightforward interpretation of ‘higher neuronal activation = greater fMRI signal’ isn’t always recommended. Let’s briefly highlight a few potential concerns, which are relevant to the paper in question. 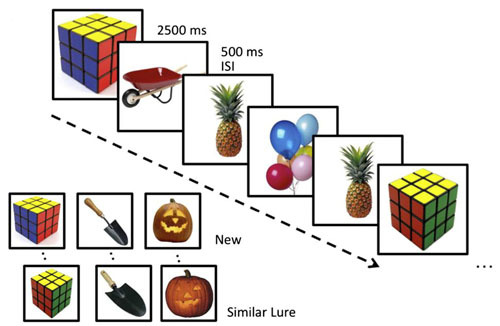 While it’s generally true that the fMRI signal (in a given area) tends to increase as the subject is performing a more demanding task (which depends on said area), a similar behavioural performance may also sometimes be associated with comparatively lower fMRI responses. For example, a volunteer who has had lots of practice doing a task, may be using his/her brain more efficiently and may in fact show a lower fMRI signal than a novice performing the same task. Conversely, there is an upper plateau above which blood flow capacity (and hence the associated imaging signal) cannot rise, even if neurons would be firing at a higher rate. This becomes particularly relevant in diseases with a known vascular pathology, such as Alzheimer’s disease. For example, the ApoE4 genotype is associated with blood vessel breakdown. This genotype is one of the few known risk factors for progression from amnestic mild cognitive impairment to full-blown Alzheimer’s dementia. Can we assume that patients with malfunctioning blood vessels show the same coupling between blood flow changes (hence fMRI signal) and neuronal activity as are usually (being) tested in healthy volunteers or animals? Another common interpretational problem is that an increase in blood flow is a summation of all kinds of neuronal activity, especially since the fMRI resolution is in the order of a few millimeters, whereas neurons are situated in the mircometer range. Any process that requires energy can increase blood flow demands, whether it is cells within the area talking amongst themselves, sending out output to other remote areas of the brain, or getting input from elsewhere. Current research suggests that these 3 function contribute to the fMRI signal in order of decreasing importance. Even if we would know exactly how much these processes contribute, we still wouldn’t be able to distinguish between excitatory and inhibitory neurons firing. Both the act of activating and inhibiting other neurons requires energy, and in principle both processes could perfectly cancel each other out, causing a brain area to produce no output (e.g. subject’s behaviour) whatsoever while still consuming a lot of energy! In other words, an increased fMRI signal can equally well reflect an increased inhibition as the more common interpretation of increased net neuronal activation. But, as I said earlier, these fMRI interpretational issues are true for most studies in the field. Nevertheless, fMRI is extremely popular and ubiquitous in modern imaging, making it very easy to forget that we don’t really know, yet, what we are measuring exactly all the time. As an unnamed former chairman of the Harvard Psychology department once remarked “Do you know why they love those fMRI activity pictures? It is because they are like women: they are beautiful, they are expensive, and you don’t understand them…” Probably the most logical explanation for most of the observed increased fMRI signals will be increased excitatory brain activity, but it pays to remain critical, especially if we take techniques from basic science to clinical applications. Which is why it is very encouraging to come across studies such as the one described here, which take novel approaches to verify fMRI-based interpretations. To activate or not to activate, to reduce brain hyperactivity or to encourage it, that is the question. And the definitive answer may be a few more years outstanding. At present, it seems as if the harmful effects of hyperactivity could depend on timing, location and the way in which it is measured. While the study by Bakker and colleagues is in need of further validation, it opens up interesting new avenues of research that may, one day, contribute to finding the long and eagerly awaited cure for Alzheimer’s dementia. This entry was posted in Neuroscience and tagged Alzheimer's, Alzheimer's Disease, antiepileptic, cognition, cognitive science, epilepsy, fMRI, hippocampal, hippocampus, Levetiracetam, memory. Bookmark the permalink.